Sister Marie Albert Kunberger, I.H.M. Sister Marie Albert, formerly Elizabeth M. Kunberger, died suddenly Jan. 20 in Paoli Memorial Hospital. She was 82 and in the 60th year of her religious life. Born in Philadelphia, Sister Marie Albert entered the Congregation of the Sisters, Servants of the Immaculate Heart of Mary in 1953 from St. Gabriel Parish in Philadelphia, and professed her first vows in 1955. She received her Bachelor of Science degree from Immaculata University before entering the congregation. In 1963 she received a Master of Science in Home Economics from Drexel University. 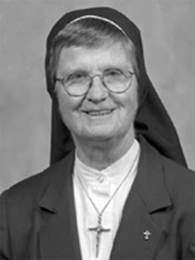 Sister Marie Albert taught at St. Hubert Catholic High School for Girls in the Archdiocese of Philadelphia and at Lancaster Catholic High School in Diocese of Harrisburg. In 1966 she was assigned to Immaculata University, where she was an associate professor in the Foods/Fashion/Nutrition Department. During that time Sister Marie Albert served for many years as the chairperson of the department. After being given the status of professor emeritus by the Board of Trustees in 2003, she gave service in the Alumni Relations Office. The funeral Mass was celebrated at Camilla Hall, Immaculata, on Jan. 25. Father Timothy M. Judge was the celebrant and homilist. Father Christopher B. Rogers, chaplain at Immaculata University, was a concelebrant. Deacon Thomas O’Brien was present in the sanctuary. Interment followed in the Immaculata Cemetery. In addition to the members of her religious community, Sister Marie Albert is survived by her brother, George, two sisters-in-law, Theresa and Rosalie, nieces, nephews, grandnieces and grandnephews. She was predeceased by her parents, Albert and Josephine Brookes Kunberger and four brothers, William, Harry, Martin and Albert.